Have you ever wondered what’s the best relaxing or recharging workout for your body and mind according to your job? Workout by the the job I practise … Hmm, I haven’t thought about that before, and have you? Neither of the job descriptions I’ve read include anything on the subject, either. There must be a specific workout to relieve the stress you accumulate during a busy day at work and that workout is especially for you by the job you have and practice. Having all these in mind, there must be a special set of exercises to help you relax and relieve stress after a long day at work. Tose exercises must be suitable for your body and mind according to the nature of your job. I can’t believe I haven’t thought about that before …. 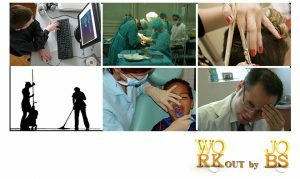 Each one of these jobs are physically and/or mentally stressful to the people who practise them. So I have picked and chosen a special workout to help you feel relaxed, stress relieved and fit so that you can continue do your job without the annoying stiffness and/or pain in the back, shoulders, arms, legs or any other part of your body that hurts. You can workout either at the gym or at home. It all depends on how busy you are and if you can spare an hour or two in the gym with a personal fitness instructor to help you out, or you can do all exercises all by yourself at the comfort of your own home. Stretch your legs at shoulder width and touch the ground with both hands. Then lift your right arm vertically and turn your head so you can see your right hand’s finger tips. Repeat the same stretching with your left arm, as well. Once is enough for a start. Keep the position for up to 30 seconds or until you feel a snapping sound as the tendon returns to its original position. Let’s continue with some legs exercising. Lift your right leg from the ground and start waving it forward and backward while balancing with your arms. Strengthening the rotator cuff in the shoulder joint. 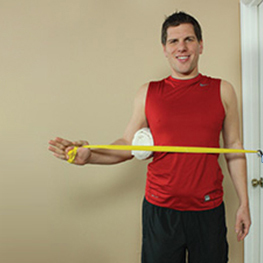 This exercise is for relieving the muscle pain in the rotator cuff that occurs among dental specialists due to constant elevated arms posture. With the door anchor at elbow height, stand at a right angle to the door holding a small pillow or rolled towel between your elbow and your body. Squeeze shoulder blades together then slowly rotate the arm outward, then return. Keep the elbow pressed firmly against your side throughout the exercise. You should be able to perform 10-20 repetitions easily. Repeat with other arm.